Gifts will be wrapped in tissue and tucked into a reusable canvas tote bag (colors will vary) topped off with a festive bow and handwritten tag. I believe in fairies! 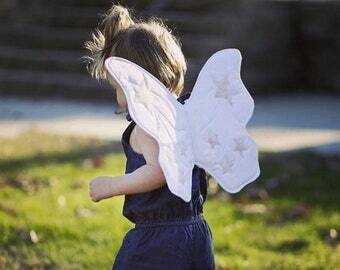 Heirloom quality quilted fairy wings for pretend play, kids costumes, dress up, make-believe, imaginary play, or toddler costumes. A beautiful photo prop for your holiday or birthday photoshoot! Or everyday wear for fabulous youngsters! 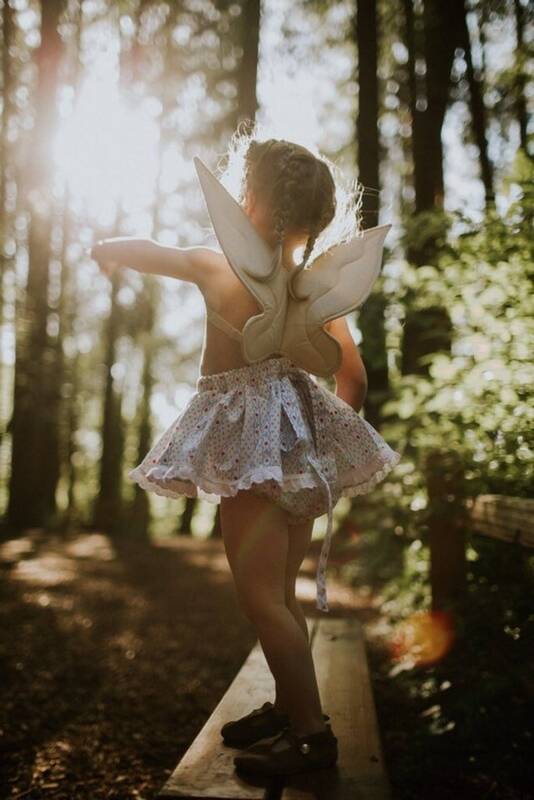 Your little one will look so adorable in their gold shimmer fairy wings! 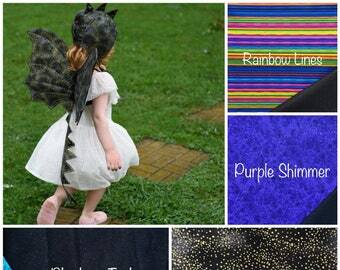 Each pair is unique and handmade with love, perfect for your precious little pixie. A one of a kind gift idea for one of a kind kids! These wings are made to order. Please allow 1-2 weeks for your wings to ship. Since these wings are handmade, fabric and design placement may vary slightly. Please contact us with questions or custom requests. High quality cotton fabric with multiple layers of internal filling to help wings keep their shape while staying soft and safe for all kinds of play. Regular size: Wings are approximately 13 inches wide and 16 inches tall. The center of the wings is approximately 6 inches long. Best for kiddos 1 and up. Mini size: Wings are approximately 9 inches wide and 13 inches tall. The center of the wings is approximately 5 inches long. Best for kiddos from sitting babies through size 4/5. These wings feature adjustable elastic arm straps that should fit kids from toddler to pre-teen, depending on size. We recommend that wings be spot cleaned only. Are these wings not exactly what you had in mind? These wings are available in over 30 different fabrics. Please see our other listings. Still not don't see what you need? Just contact us! We can make custom wings that will be the perfect fit! Better than I dreamt of!! Purchased for my daughter's 2nd birthday and she was in absolute love. She ran all over Longwood Gardens with her fairy wings and it was to die for. So well made, they were worth every penny. Matching bonnet for the perfect costume! The shop was very responsive. The materials used are super high quality, we are totally in love with this item. Perfect size for my nearly 3 y/o. Love love love It!